As we depart the unusual, but well appreciated rainy weather of the west coast and trot across the country to the east coast, we look forward in anticipation to a gathering of friends and family in a festive celebration in Northern Virginia. Thanksgiving is always a joyous time to show gratitude to friends, family, loved ones and to that, we say a special thank you to YOU, our customers and loyal readers! It’s also a time to appreciate all that we have including the little things that we so often take for granted – like the cornucopia of choices we have when it comes to food and preparing this special feast. I grew up on a traditional thanksgiving meal of turkey, rolls, green beans, squash and stuffing. However, as an adult, I make choices that are intuitively more in alignment with my beliefs. It’s a funny thing because, although cliché, knowledge really is power when it comes to making choices for you or your family. It is important to learn and listen to what feels right for you. We are always here to educate you, and then allow you to sail your ship you in the direction of your own individual course. So, here are a few swaps, some of which are featured in our book, Just Green It! to help you understand the choices you have and empower you as a consumer to be cognizant of how even your small swaps can have a lasting impact! 1. Go Organic! Look for turkeys labeled USDA organic that meet specific requirements of organic farming. Turkeys labeled “natural,” “pastured,” and “conventional meat” do not have the same standards or inspections as USDA Organic. 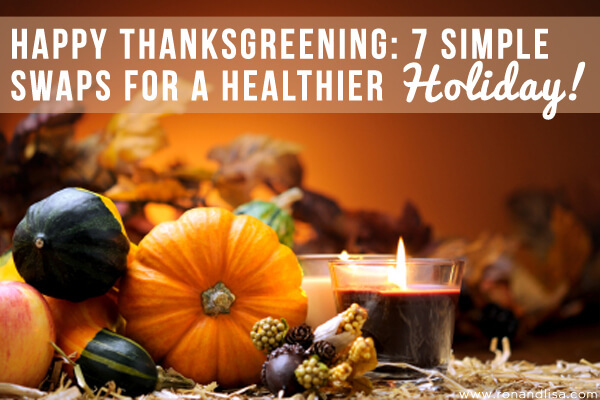 Organic turkeys may not receive antibiotics, arsenic compounds, or animal byproducts, and must eat 100% organic feed. 2. Don’t Get ‘Stuck’ on NON-STICK! Did you know that PFCs — Perflourochemicals (PFOA and PTFE) — are used in the manufacturing of Teflon and in other coated items. Teflon and other nonstick pans begin to break down and release toxins into the air at a temperature of only 446° F. They are a likely carcinogen, as they have been shown to cause cancer in animal studies. Cook instead with: cast iron, food-grade stainless steel or Anodized Aluminum for cooking and glass, earthenware or cast iron for baking. 3. Don’t Get Green-Washed! Paying more for turkeys labeled ‘hormone-free?” Save your dollars in this department because no poultry in the U.S. is allowed to receive hormones. They are in fact, all hormone-free. 4. Go Veggie: Acc’d to National Geographic’s green guide, British economist Lord Stern and American novelist Jonathan Safran Foer, among others, are ‘promoting vegetarianism as the most responsible and ethical choice for the planet.’ Turkeys on factory farms are deprived of the simplest of pleasures, like running, building nests, spreading their wings, raising their young, and worse, are killed when they are only 5 or 6months old. After their beaks and toes are burned off with a hot blade, they are crammed into grimy sheds. If you can’t verify the source, opt for Tofurky that is non-GMO and vegan. 5. Choose a Turkey that was Treated Fair! “Free-range” This term is regulated by government and indicates the turkey must have access to the outdoors, but it can be just a small fenced area. “Pasture raised” is a better choice, but it isn’t regulated. Look also for The “Certified Humane” label, a highly meaningful term that indicates the turkey was treated humanely. Learn more here. 6. Avoid White! We all love a warm roll fresh from the oven. However, you want to make sure you are eating the correct type of carbs. A “good carb” contains “whole-grain” or “stone-ground” flour. Don’t look for this on the outside of the package as they can stretch the truth here. Look for these words near the top of the ingredient list. They contain the entire grain kernel, hence more nutrients. Remember just “wheat flour,” and “unbleached wheat flour” are not the whole grain. 7. Offset your Turkey Footprint! The livestock sector, which includes turkey & poultry, contributes to almost 18% of the total sum of greenhouse gas emissions emitted each year, according to the Food and Agriculture Organization. The waste from these industrial factory farms is astounding and can create noxious ammonia fumes and pollute water. Here is a great LIST of carbon offset companies (including travel, animal waste, methane capture and combustion). Enjoy your Thanksgiving Holiday. Be Green & Be Healthy!